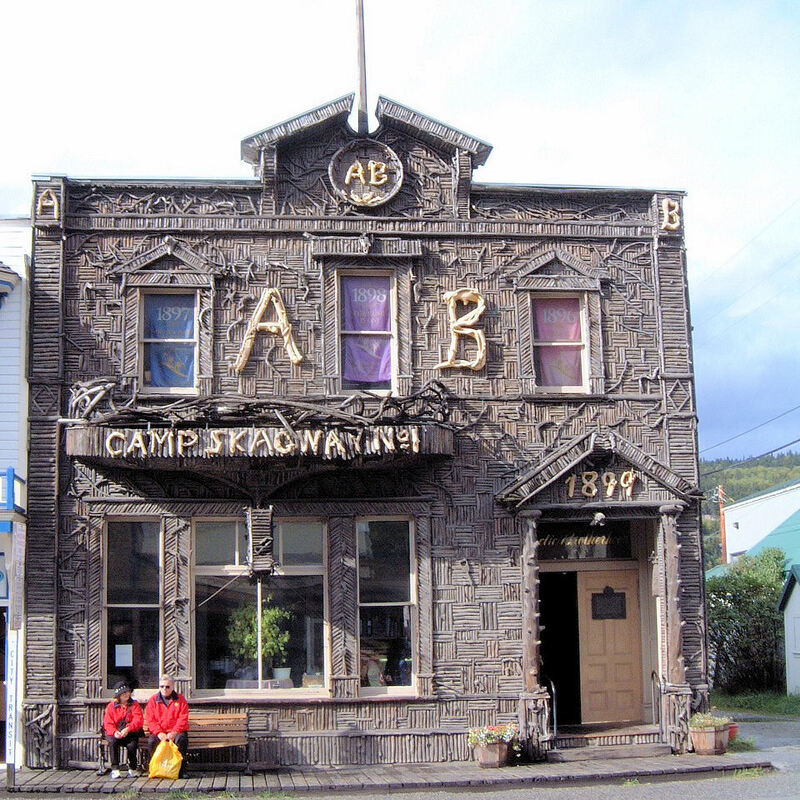 This picture apparently hangs in the Peniel housing in Skagway. It is a photo of Victorine Yorba Tooley on the left seated and Mabel Ulery (Mrs. Holmes Cox) on the right, seated. 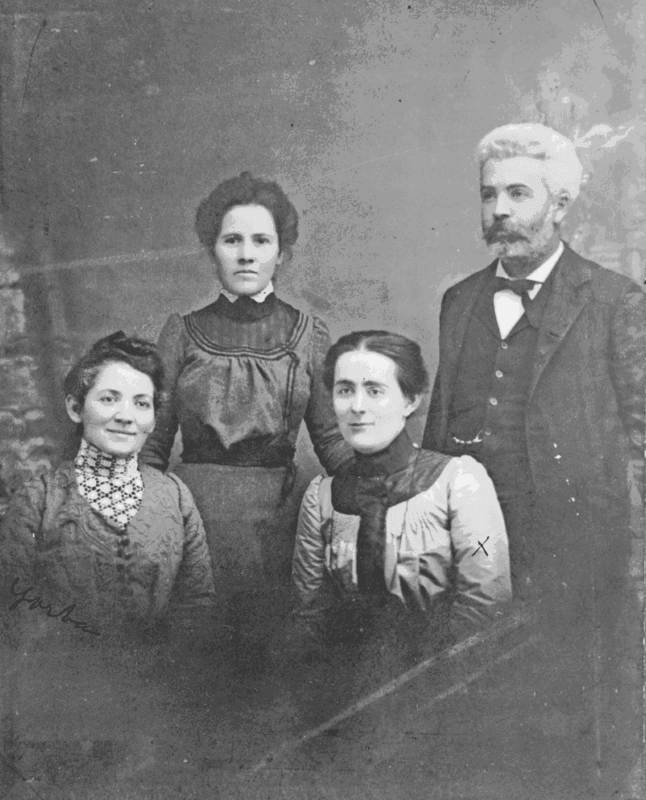 The woman standing could be Miss Kline, Miss Josie Barnett, Gusta Carnahan who was Victorine’s sister or Roberta Yorba, Victorine’s daughter. Having lived in Skagway for over a decade I was surprised to learn that some people had not heard the story that the front of AB Hall is actually a secret map to a gold mine. Despite the thousands of pictures taken every summer, no one has yet figured it out. This major flood happened in Skagway in September 1919. This is when the train tracks crossed the Skagway River and ran on the west side of the river and then crossed back to the east side up the way. Last Friday rain started to fall in torrents in the mountain surrounding Skagway and by the following morning the Skagway river was a raging flood, filled with trees and driftwood, that carried all before it. Four bents were washed out of the railroad bridge near the car shops and eleven bents out of the railroad bridge at four mile post. The weather reached the decking of the first bridge and the driftwood pilling up against it threatened at one time to cause the whole structure to go out, but a flat car with a derrick aboard was put into operation and the trees and logs hoisted over the bridge and dropped into the stream below. 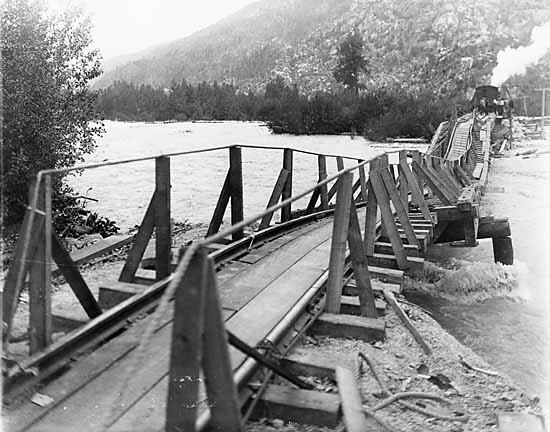 The government bridge across the Skagway river at Twenty –Second street was damaged to the extent of having the center span carried away. At the height of the flood there was a White Pass train stranded between the first and second bridges, but since then the first bridge has been repaired sufficiently to get the train into the yards shops. After the rain started to fall it continued to pour down almost without cessation until yesterday afternoon, when it commeneed to let up, and the weather was reported to be clearing and river falling. Section men from Carcross, Pennington, Bennett, Log Cabin, Summit and Glacier were rushed over to Skagway to assist in the work of controlling the flood and are still there. Yesterday afternoon a telephone message was received here from General Manager II. Wheeler at Skagway, saying that the Skagway river was threatening the track near Boulder and asking that a work train be made up here and rushed over with a load of sacked gravel to use in checking water’s inroads. The train, consist of an engine and three flat cars left here at 7 o’clock this morning to load 500 sacks of gravel at the 98 mile post. A train was run from Whitehorse Tuesday and the passengers and mail transferred at the washout. They connected with the Princess Alice, which sailed from Skagway Wednesday night. There have been no train since then and it now seems probable there will not be until Saturday or Sunday. There is a lot of perishable and other freight for the interior now in Skagway which cannot be moved until regular train service is resumed, which will likely be first of next week. Happy Birthday to little Calantha who was born on this day, September 28, 1896 in Angel’s Camp, Calaveras County, California. Her father, Wallace was a jeweler from San Francisco who seemed to follow the gold. In 1887 he was a watchmaker in Sacramento. He and his wife, Annie Dorothea Westfall and Calantha came to Skagway from Oakland about 1899. Calantha may have attended school in 1900 when they were here for the census, or maybe not. 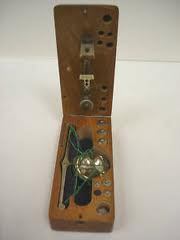 Wallace invented a portable weighing scale and received a patent on it in October of 1899. It would have been a good thing to have in the field where gold dust was the method of payment. They moved back to Oakland where he was a jeweler. Calantha married in 1916 and had a son. She died in 1971 in Fairfield, Solano County, California. 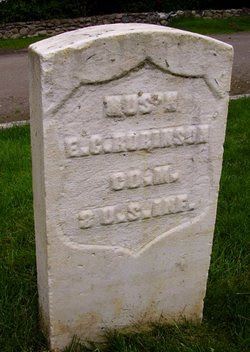 This Edward Robinson was an army soldier here in 1903 where he succumbed to pneumonia on this day, September 27, 1903. He was only 29 and his body was sent to Seattle for burial. He is buried at the Ft. Lawton Military Cemetery. Seen above is his grave marker which says he was in Company M of the 8th US Infantry. Previous to this I thought that the 8th Infantry had arrived in July of 1904, but this proves they were here earlier. 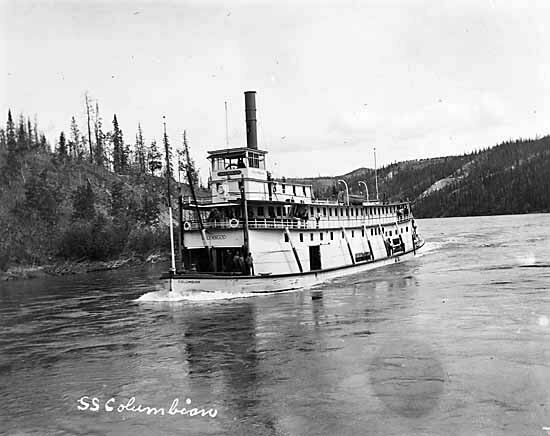 The sternwheeler Columbian was lost in the worst accident in the Yukon River’s history on September 25, 1906. On the day of the accident, The Columbian was carrying only one passenger—Ernest Winstanley, a stowaway who had sneaked aboard, pretending to be the caretaker of the cattle on board. One report said he was kicked off when the ship docked at Tantalus, but another gave his medical condition while in hospital in Whitehorse. The explosion happened at Eagle Rock when Phillip Murray showed a loaded gun to Edward Morgan, who accidentally discharged the gun into the load of blasting powder stored on deck. Morgan was killed instantly. Following the ensuing explosion and fire, the captain grounded the ship on shore and those uninjured or killed by the blast jumped ashore. The explosion blew out the sides of the vessel, scattered men and cargo in the water, and in less than five minutes had involved the whole inside of the ship in a mass of seething flame. The crew had no provisions and no way to easily go for help. The closest telegraph office was thirty miles away at Tantalus. A party of three set out on foot but they were overtaken by Captain Williams and Engineer Mavis in a canoe they had borrowed from a woodcutter. Arriving at Tantalus after midnight, they woke up the telegraph operator who sent out a message about the disaster with no response—all the other operators were asleep. The first to receive the message, at 9:00 a.m. on September 26, was at Whitehorse. The first ship to arrive at the scene of the explosion was the sternwheeler Victorian, arriving at 7:00 p.m. Captain Williams had returned that morning to find that Carl Christianson and John Woods had died during the night. Phillip Murray died shortly after being carried aboard the Victorian. Another sternwheeler, the Dawson, had been dispatched from Whitehorse with a doctor and nurses aboard. The Dawson had not received the news until 1:00 p.m. on September 26 and at 1:00 a.m. on September 27, the Dawson took the crew of the Columbian on board and returned to Whitehorse. Soon after, when Lionel Cadogan Cowper, the purser died in Whitehorse the death toll rose to six men. “Ernest E. Winstanley, the only survivor among seven victims of the explosion and fire on the steamer Columbian, which disaster occurred on the Yukon river on Tuesday, the 25th of September, is still at the general hospital at this place where, under the skillful treatment of J.P. Cade and careful nursing of the hospital corps, it is believed he will recover. Winstanley displays wonderful fortitude and it is believed will be able to leave the hospital in another month or six weeks. His father Ernest Winstanley, arrived Sunday from Dawson and is spending much of his time at his son’s bedside. “Today at 11:30 an artery in Winstanley’s neck burst and this may tend to complicate his chances for recovery.” Apparently they credited his long woolen underwear with keeping him from being burned over much of his body, but his face and hands were burned. He did survive and on September 31, 1906 he moved to Galiano in southern British Columbia where he was a farmer in the 1911 census. Also lost was her cargo of 150 tons of vegetables and meat, and 21 head of cattle. The disaster is described in “Fire on the Yukon” by Sam Holloway. 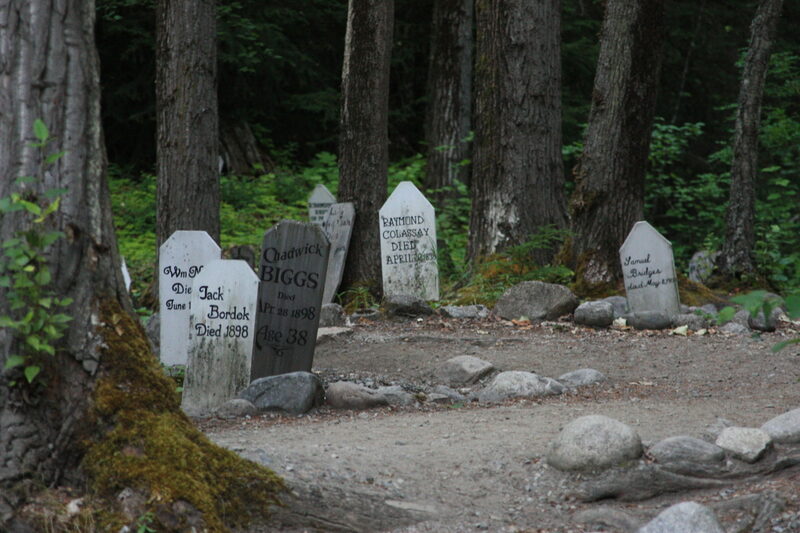 A memorial to the victims was erected in the Whitehorse Cemetery by the employees of the British Yukon Navigation Company. The Columbian is seen above in better days in 1903. Explore North; NWMP record; wikipedia; Dawson Daily News, September 26, 1906; Hougen group website; BC 1911 census online; Yukon Archives – Benjamin Craig’s list of people leaving the Yukon. Hazel was born in 1913 and grew up in Skagway. Her dad was a Councilman and a manager of the meat market. Today is her mother’s birthday (see previous blog on Ellen Orr Batson). Hazel moved to Yakima, Washington where she married in 1944. 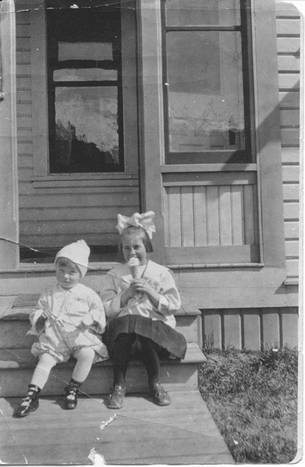 Seen above with her friend John Weise in Skagway about 1918. There are records of a total of 98 people that died on April 3, 1898. All but three died in the avalanche on the Chilkoot Pass. Wilbert Garfield Packard of Riverside California, born on this day, September 20, 1881 also died on that terrible day, but he died, along with two other men, of spinal meningitis. 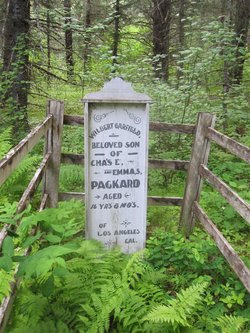 His marker in the Dyea Slide Cemetery says he was 16 years and 8 months old, the beloved son of Charles and Emma Packard of Los Angeles. Packard family site on Genforum. On this day, September 19, 1897 two men died – one on each summit. Fred Cope, the ex-mayor of Vancouver, British Columbia, drowned in Summit Lake which is just over the White Pass. He was buried on the shore there. The election of Fred Cope in 1892 was the closest in Vancouver’s history, with a winning margin of 11 votes over his rival Dr. J.T. Carroll. Cope was the youngest mayor in Vancouver history, only 32 when elected. 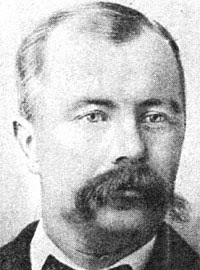 “During Fred Cope’s mayoralty, Vancouver was experiencing its first economic slowdown and Mayor Cope’s efforts were directed to limiting expenses. City staff were laid off and those remaining had pay cutbacks. The Canada-Australia Steam Line began servicing Vancouver because of Mayor Cope’s efforts, with the first ship (RMS Minonuera) arriving in Vancouver June 8, 1893. He was elected mayor for two consecutive terms. Cope died while prospecting in Alaska during the gold rush. He fell from his horse while crossing a stream and drowned.” His photo is above. Meanwhile, in a letter by George Young, a goldrusher on the summit of the Chilkoot Pass, he stated: “An old man who had his goods as far as the summit of the pass went back to Skagway to get horse feed and died of heart disease. His wife was along, but she has turned back. This is the saddest thing that has occurred.” -from George Young’s letter Sept 19, 1897. Obituary Met Vancouver newspaper Oct 2, 1897; Skagway death record; Victoria Colonist says he was buried in situ because of advanced decomposition; The Vancouver Sun online obituary. Ok, so here’s a good one. There was no William G. Martin who was lynched on September 11, 1897 at Lake Bennett. This was a false story reported by Hal Hoffman to the Chicago Tribune and repeated many times thereafter. It is still falsely cited on the “land of the free” website. William R. Hunt in the book “Whiskey Peddler, the story of Johnny Healy, North Frontier Trader” (1993) refutes this story. Now this is not to say that there weren’t other cases of frontier justice as there are even pictures of men being whipped on the trail for theft. One man even committed suicide to evade such punishment. 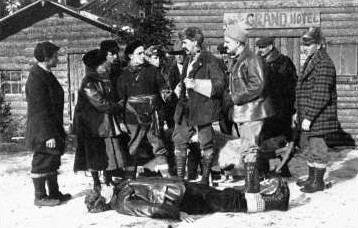 The photo above is a staged photo for a 1915 book about the Shooting of Dan McGrew.